On May 21, the young teacher became the city’s first cycling fatality this year. Her family and friends remember her love of nature, and how she saw the world from two wheels. As rush hour ends on May 28, a crowd of about 300 cyclists pedals along Dartmouth's Windmill Road at a jogger's pace. At times a bike bell rings out and others chime in. It is cool but sunny, much like the afternoon Johanna Dean passed away. A week earlier, just before 3pm, the 30-year-old elementary school teacher was biking north on Windmill Road. According to police reports, as she reached the traffic lights at Albro Lake Drive, the driver of a truck also travelling north turned right and struck her. She died shortly after. Wearing pink, Dean's family and friends lead the memorial ride on their bikes. After travelling the route Johanna cycled, Julie Dean understands why her twin sister biked that way. "It certainly is beautiful with the churches and the houses that are well kept," she says. "Even going underneath the bridge is beautiful, and the glimpses of the ocean too. So it makes sense why she came this way." While scenic, Windmill Road is also a major truck route. During the memorial ride, large trucks frequently passed the cyclists travelling in the opposite direction. 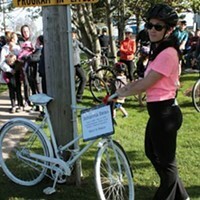 Cassy Were didn't know Johanna but joined the memorial ride after hearing her story. Were, also a cyclist and teacher in her 30s, bikes the same route to work Johanna did. The most dangerous part of Windmill Road for cyclists are the cars parked along the side, she says. They squeeze the already narrow road and limit visibility. Parked vehicles combined with truck traffic mean cyclists have to be even more vigilant, she said. A large vehicle may have been parked too closely to the intersection at the time of the accident, which could have limited visibility, Julie says. The police investigation isn't finished, so it's not clear exactly what factors contributed to the collision. Johanna was wearing her helmet at the time of the accident, although an early report said she wasn't. "I have the helmet at home and it is cracked in two pieces," Jackie Dean, Johanna's sister, says. Dean was a cautious cyclist who always wore her helmet and used her bell, her friend of six years Allie Nugent says. Nugent feels comforted after biking the route, knowing Johanna was likely smiling in her final moments before the crash. "She probably would have been singing to herself," Nugent guesses. Dean had a silly sense of humour, and the two friends would often get into fits of giggles that would last so long their stomachs would hurt. Nugent once visited Dean's class to help the kids make gingerbread houses. "The students loved her," she says. "They looked at her as a friend, almost, so they would run up to her and hug her legs." She was the type of person who always had to be doing something, Nugent remembers. If she was sitting down, she had to be playing a game. At Easter they would paint eggs and have a hunt in the backyard. One of Nugent's greatest memories of Johanna was when they cycled together along the power lines on the Mainland North trail in Clayton Park. She loved outdoor activities, especially biking, her friends and family said. Julie looks back fondly on a bike trip she took with her best friend and soulmate. "We went biking up the Salt Marsh Trail when we both moved back to Halifax after graduating from university and moving away for our first jobs," she says. "We loved being outside because we did really connect with nature." 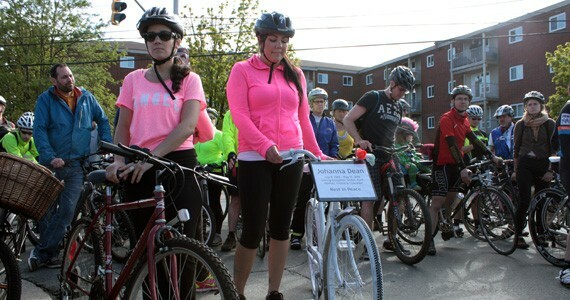 With the help of Halifax Cycling Coalition members, Dean's family and friends lock a white ghost bike at the corner of the fatal intersection, where it will be visible to both vehicles and cyclists. Someone places a bouquet of blue forget-me-nots in its spokes. "The purpose of a ghost bike is two-fold: it's a political statement saying the roads aren't necessarily very safe–to point out exactly where every incident happened–and it's also a memorial," explains Matt Worona, who donated the old bike and painted it white. Another ghost bike near North and Gottingen streets honours Corey Mock, according to ghostbikes.org. Posts on a Facebook memorial page say the 32-year-old died July 10, 2001 after he was hit by a garbage truck. Several friends remembered him as a great dancer who was always smiling. Another ghost bike was placed at the corner of Cornwallis and Barrington Streets following Michael Brooker's death on October 11, 2007. According to a police report, Brooker was biking south on Barrington Street, another major truck route, when a flatbed truck hit him. He was pronounced dead at the scene. No charges were laid. He was 19. 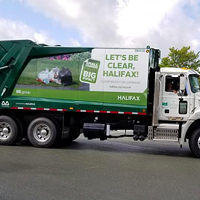 Due to complications with the police data system, it is difficult and time-consuming to extract data about vehicle-cyclist collisions prior to 2013, so these numbers are not available, says Halifax Regional Police spokesperson Pierre Bourdages. The system does not go back as far as 2001, so it was not possible for him to say whether charges were laid following Mock's death. In 2013, there were 37 vehicle-bike collisions reported in HRM, but no fatalities. So far in 2014, there have been 11 vehicle-bike collisions reported. The one fatality was Johanna Dean. At the memorial, her twin emphasizes she did not fault the truck driver who hit Dean. "There's no one to blame. This was an accident." No charges have been laid in the case. Julie Dean has not visited the intersection before the memorial ride, so the experience gives her a sense of closure. Cyclists circle around her as she stands in the middle of the road holding the handles of the white bike. "Thank you everyone for all your love and support," she says. 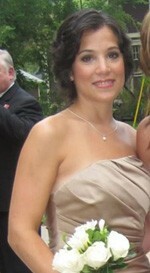 "I know Johanna is seeing this and is deeply touched and is sending her love right back to you. I want to thank everyone for coming together to raise awareness on issues of bike safety that need to be handled in Halifax." Correction: The original text of this story as published June 5 has been changed to fix a couple of errors. For example, we said the route Johanna was biking when she was hit by the truck was her standard route to work, when it wasn't. And an editing error caused Johanna's sister Jackie Dean to be identified as her mother. We sincerely apologize to the Dean family for the mistakes, which were caught and corrected by June 11, 2014. Council agrees to spend $238,000 retrofitting the life-saving devices onto the privately owned fleet of vehicles. Side guards for trucks could be mandatory, but they’re not.